Littlegreenshed - UK Lifestyle Blog: Hey diddle diddle..
Christmas and a trip to the theatre go hand in hand. As a family we always try to go. To me, it is an important part of the Christmas magic. This and maybe a sprinkling of snow! A few weeks ago, in the heady excitement in the run to Christmas, I took the boys to see a spellbinding performance of Hey Diddle Diddle at the Bristol Old Vic theatre. 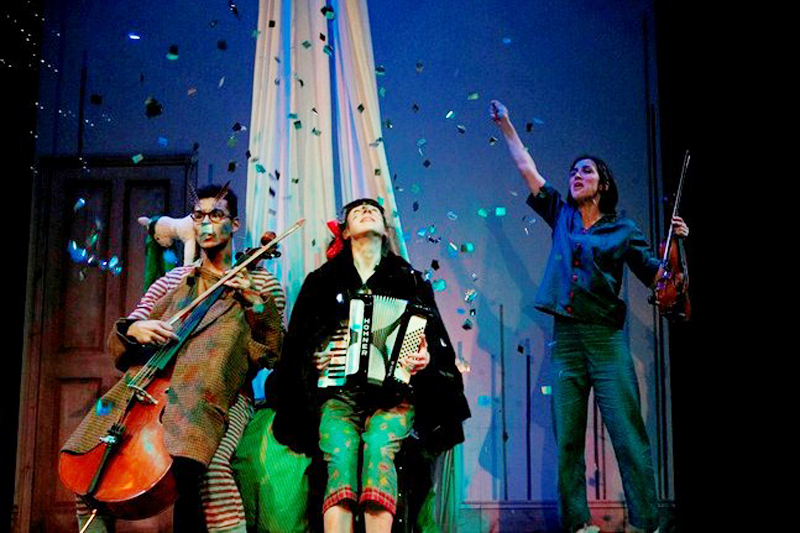 Written for younger audiences aged 3-6 years, the show is performed by just three actors - each one playing an instrument, acting and singing to bring the story to life. Popular nursery rhymes blended seamlessly to bring together a quite enchanting tale. I thought Charlie would be a little too old for this style of performance, but he soon became swept along with the magic of each story, singing loudly to The Grand Old Duke of York and snarling to show his wolf like teeth! Rufus' only words throughout was 'that's really cool' when the youngest child/actor climbed up into the fabric and hung from the ceiling as a spider. As I no longer have toddlers, we don't seem to sing nursery rhymes much. I love to recall them and remember singing Twinkle Twinkle to my boys. My favourite part of the play was the Owl and the Pussycat - I must get myself a fur coat! Hey Diddle Diddle is on at the Bristol Old Vic until Jan 5th. Do go along it is pure magic. this is a gifted post.